Leave your security concerns with us. Add firewall protection across all locations for just $30/month per site. Build Private Networks to block DDoS attacks and to securely share data and applications between sites and remote users. Customers choose their own private IPs. Our cloud-based Managed Private Network service is more efficient and less expensive than purchasing and managing a firewall at each location. For those sites served by Skyway, it eliminates delays from encrypting interoffice traffic and eliminates the traffic that encryption adds. $30/month per site is a small price to pay for the benefit of improved performance, and savings from eliminating multiple firewalls, IT management and unnecessary traffic. Managed Private Networks are available everywhere. Traffic between sites served by Skyway never passes through the public Internet. Sites served by other ISPs can also securely connect into your Managed Private Network through a VPN. This service costs $50/month and traffic is encrypted because this data does pass through the public Internet. C. One or more static IP address can be routed through Skyway’s WAN firewall to a specific server at one of the Private Network sites. This allows the site to host a server (e.g., mail, web, etc.) accessible from the Internet. This product also meets the needs of single locations wanting to protect their network from the Internet but not wanting to purchase and manage a firewall. Our Managed Private Network service is a low-cost alternative to our MPLS, Mesh and Point-to-Point Dedicated Network services. Dedicated Networks are the most secure because site to site traffic does not pass through Skyway’s servers or the Internet. A 25-branch regional library was required to upgrade each location’s existing firewall to manage increased inter-branch traffic. This was going to result in a large capital investment at each location and significant installation and management fees to their IT consultant. They were also concerned that these costs would soon reoccur if network requirements continued to grow at the same pace. At the same time, they were frustrated both with their Internet Service Provider and with their IT consultant as each was blaming the other for network and firewall problems. Skyway West replaced their existing firewall hardware with our cloud-based Managed Private Network solution, and their internet access with a combination of Skyway ADSL and Fibre. Our solution had the added benefit of allowing the customer to continue using the same Private IP blocks without renumbering their internal network. The library immediately saved thousands of public dollars in projected infrastructure costs and Skyway’s $30/month solution saved them many times that amount in ongoing IT consulting fees. As the sole provider, Skyway eliminated the conflict between internet access and firewall management and the frustration in dealing with different providers intent on blaming each other for system failure. 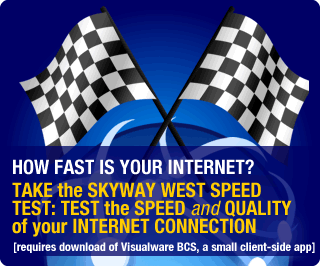 Skyway West provides Business Class Fixed Wireless broadband services in speeds from 1 Mbps to 100 Mbps and higher. Our serving area currently covers the BC Lower Mainland and 17 cities from Montreal to Victoria. Skyway Fibre and other Premium Internet Access Services are perfect for companies requiring guaranteed download and upload speeds, the best technical solution and highest level of customer support.